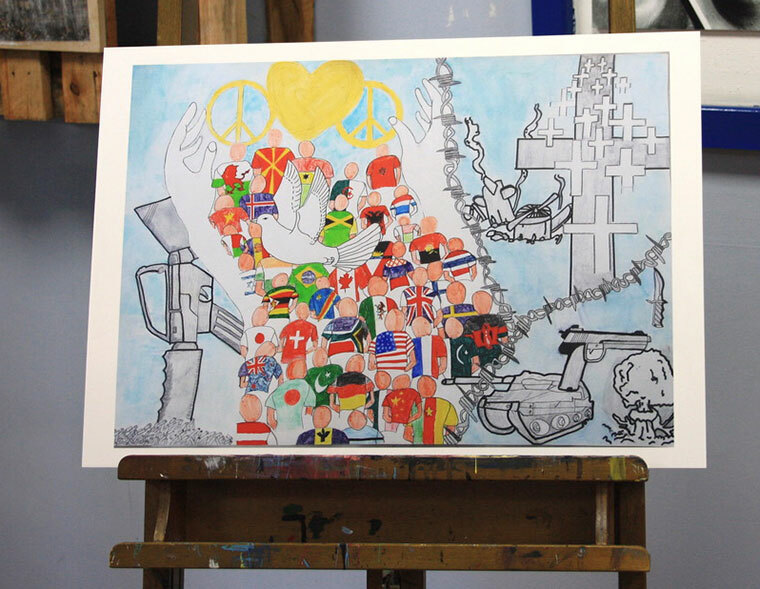 A year 8 student at Ringwood School has reached the national final of a prestigious international art competition with his peace poster. Joe Durward’s ‘Turning their backs on war’ has reached the national final of the 2017/18 Lions International Peace Poster competition. In its 30th year, the competition encourages young people in local schools and youth groups to express their visions of peace. The theme of the 2017/18 Peace Poster contest was ‘The Future of Peace’. In recognition of his achievements, Joe and his family have received an invitation to attend this year’s Lions District Annual Convention taking place at the Royal Beach Hotel in Southsea on Saturday 24 March. At this event Joe will be awarded the Lions District Peace Poster Trophy and will receive a cheque for £75.